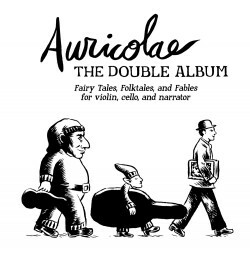 The members of the acclaimed string trio Ensemble Epomeo transform into Auricolae, a fantastical band of minstrels presenting Fairy Tales, Folktales and Fables, a 2-CD set of new music dramatized via the ageless art of storytelling. More than a dozen parables from around the world fuse traditional allegories with inventive mythical settings, pair timeless legends with new musical scores, and offer original stories whose inspiration stems from the beginning of time. The result is a truly unique synthesis of words and music that is instantly entertaining. Auricolae’s winning formula has made new music accessible to apprehensive audiences, and brought contemporary compositions into schools where students lack exposure to classical music. Along the way this merry band of troubadours has built an enthusiastic and enchanted following of children of all ages (parents included).